Flowers fragrant color white in star shape, flowers grow in clusters. 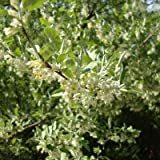 Elaeagnus umbellata AUTUMN OLIVE Tree Seeds! What can be done with big quantities of Autumn olive fruits?